Located at the mountain village of Danao, 19.6 kilometers from Ormoc City, LDNP has a potential as a tourist attraction, but a lack of facilities hampers its growth. Active Genuine Youth Leaders Association (Agyla) tries to address this limitation by developing a small area of the lake at Hagimit subvillage with simple amenities like a floating cottage and two lakeside cottages that will benefit the locals, particularly those from zones 5 and 6. Agyla executive director Richard P. Impas who is also a village council member there took inspiration from the eco-tourism destinations in Thailand where he was sent on a study tour February last year by Germany’s Afos Foundation for Entrepreneurial Development Cooperation. Impas went to a mountain community in Chang Mai occupied by the Karen tribe and was surprised to see it teeming with tourists even though Lake Danao is more attractive. This challenged him to implement a tourism livelihood enterprise in his neighborhood. Securing a PHP236,000 grant from international non-government organization Care, he went on to develop community-based eco-tourism facilities. He organized the residents and paid some of them for PHP236 a day to clear the area and the path leading to the site as well as to construct the cottages. For PHP600, visitors can rent the floating cottage, and PHP300 to PHP500 for the lakeside cottages the whole day. There are also 13 paddleboats, each with a carrying capacity of six passengers that can be rented for PHP50 an hour. This translates to additional income for the boat owners who go out to fish at night. More cottages are planned, this time for massage services to be rendered by locals trained by the Technical Education and Skills Development Authority. Tour-guiding services will also be offered to tourists who want to go either to Alto Peak or Ginduhaan (Twin) Falls in Cambantog village. Eight houses are being prepared for home stay services that will also offer meals to tourists depending on the package they choose. 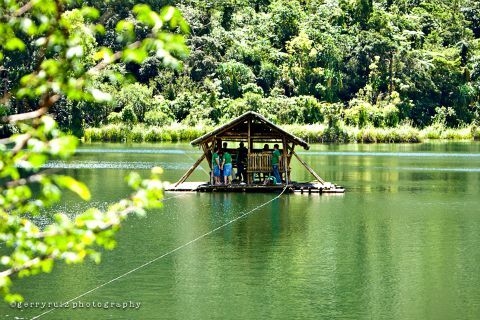 At present, Lake Danao attracts only 300 visitors every week, and residents can take advantage of the expected influx of tourists by selling food and souvenir items. The project is primarily aimed at diversifying the livelihood source of locals who are mostly small-scale fisher folk and farmers who rely on small-scale vegetable or daily wage farm work in sugarcane plantations. Others resort to kaingin or slash-and-burn farming to produce charcoal.